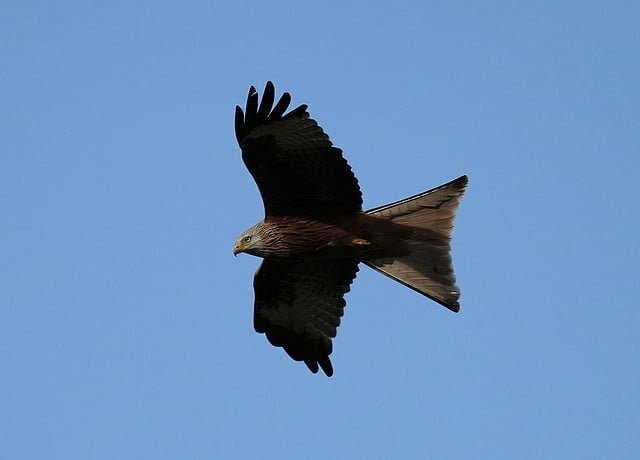 An Irish-hatched red kite has successfully reared a brood of young in Ireland for the first time in almost 200 years. The male bird was hatched in Ireland in 2010 to Welsh “donor” parents released as part of the red kite reintroduction project coordinated by the Golden Eagle Trust. This Irish bred kite successfully raised two chicks this season at a nest site in Redcross, County Wciklow in partnership with an older female released as part of the original cohort of Welsh donor birds in 2007. It marks a significant milestone in the reintroduction of this iconic bird of prey to the Irish countryside. However, it hasn’t all been good news for Ireland’s reintroduced kites this breeding season. According to the Wicklow project’s 2012 report the team located 24 breeding pairs, of which 17 laid eggs. But poor weather conditions during the breeding season, with strong winds and heavy rain, destroyed at least six nests. In total 11 pairs bred successfully, rearing 23 young kites between them. Fifty two red kite chicks have now successfully fledged in Co. Wicklow since breeding commenced in 2010 from a pool of 120 released birds. Kites start breeding from 2 years of age, so while the chicks reared by this Irish-hatched male only have half-native parentage, it won’t be long before 100% Irish-born kites are breeding successfully in Ireland again. May have seen one of these last evening over east tallaght at approximately 9pm, circling but travelling with the wind westward. Your article does not give a size referance but what I saw had the same shape tail, was about half again as big as the two seagulls who were trying to harass it (unsuccessfully). It wasnt even bothered, just kept circling and drifting with the wind heading towards Brittas direction. We have a local population of Herons at our estate close to Dodder Park so seeing this bird in a built-up area does not surprise me. Maybe there are easier pickings in built-up areas for “wild” creatures now but this was most unusual to see.